Born Lev Davidovich Bronshtein or Лев Давидович Бронштейн in Yanivka, Ukraine, in 1879, he changed his name during Czarist days to Leon Trotsky, derived from a German term for "defiance". Lenin probably would have named him as his successor, but Lenin's stroke prevented that. Trotsky was a party theorist, and seems to have been closer to the original intent of Marx than any other prominent Soviet figure. He was Marxist but not Stalinist. Not a good move when a murderous tyrant like Stalin is about to take charge. Trotsky led the Left Opposition in a failed struggle against the policies of Josef Stalin in the 1920s, a rather dangerous move. That got him expelled from the Communist Party in 1927 and expelled from the Soviet Union in 1929. 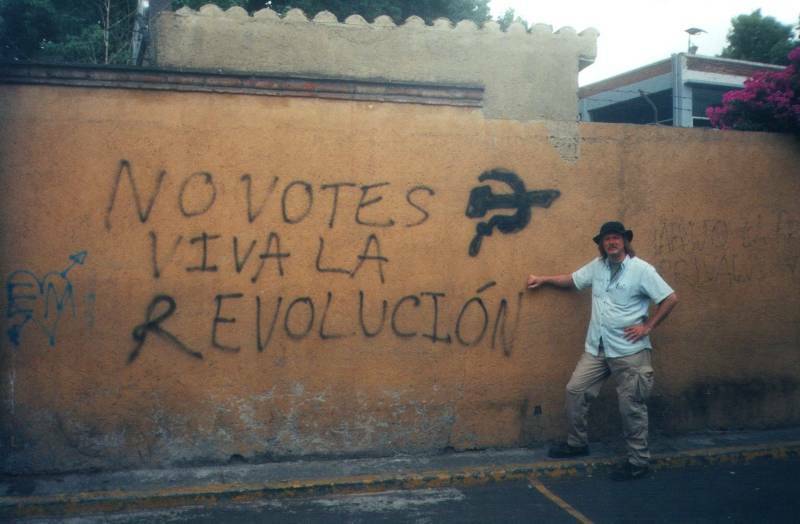 Trotsky fled for exile in Mexico as Stalin seized power. He was sentenced to death in absentia, and was assassinated by an agent of Stalin with an ice ax in Mexico City in 1940. 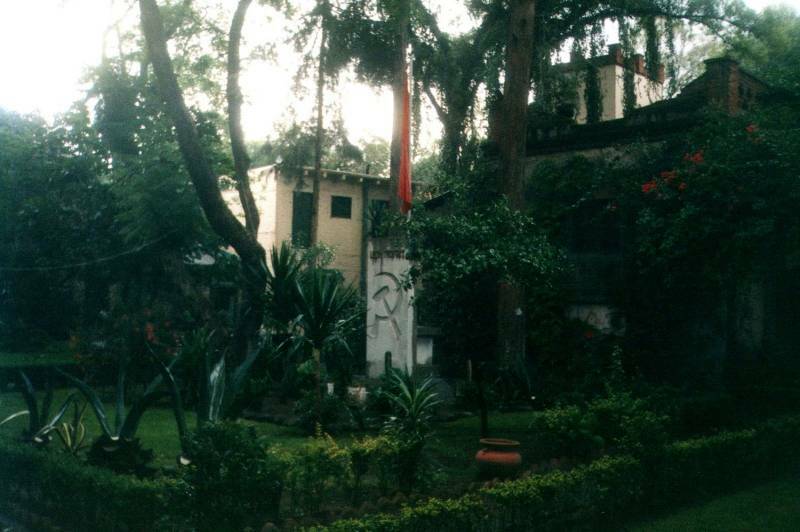 You can tour Trotsky's home in Mexico City. His home is very swanky. The communist leaders were all for collectivism and "from each according to his abilities, to each according to their needs", so long as it didn't apply to them. Their needs-to-abilities ratios were always rather high. We're on the way to Trotsky's house. The local revolutionaries have marked the way! His estate was was enclosed by a strong wall erected after the first assassination attempt. See below for some details of this attempt. 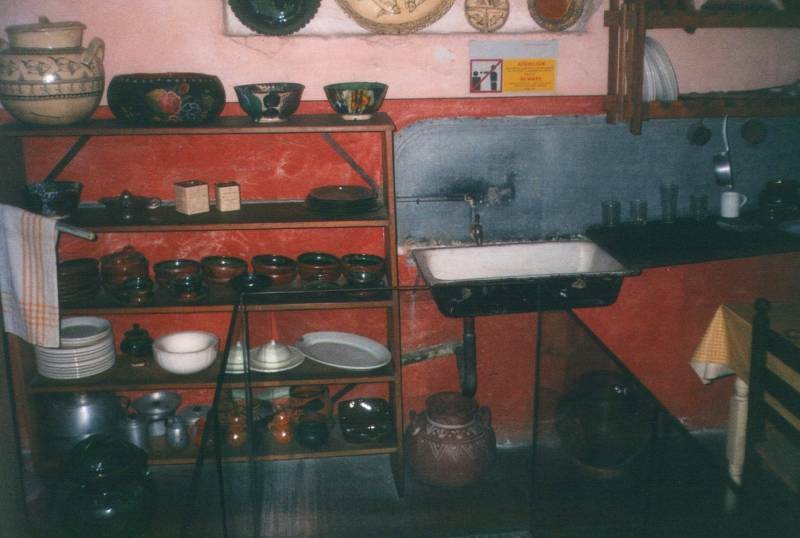 This is Leon Trotsky's Kitchen If you enjoy seeing Leon Trotsky's kitchen sink, then you should check out my page showing Trotsky's toilet. 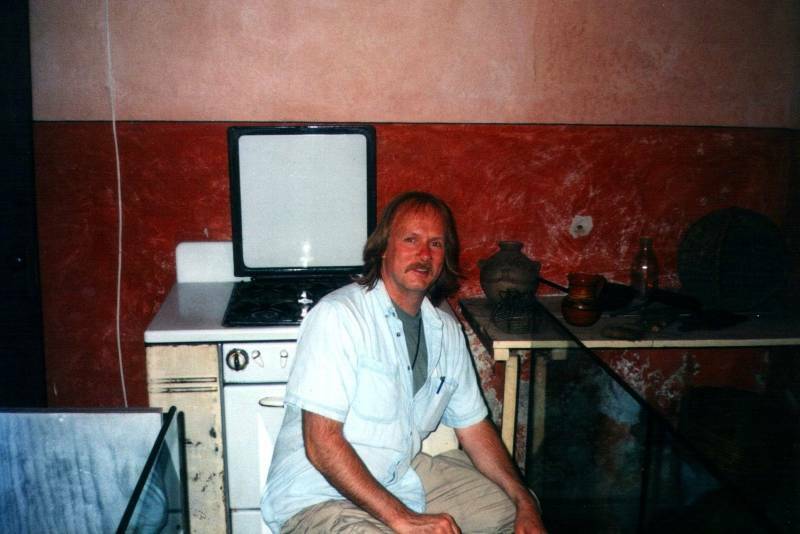 Here I am in Leon Trotsky's Kitchen! Right there in front of Leon Trotsky's stove! And his pots and pans! Notice the wall? See what color it is? 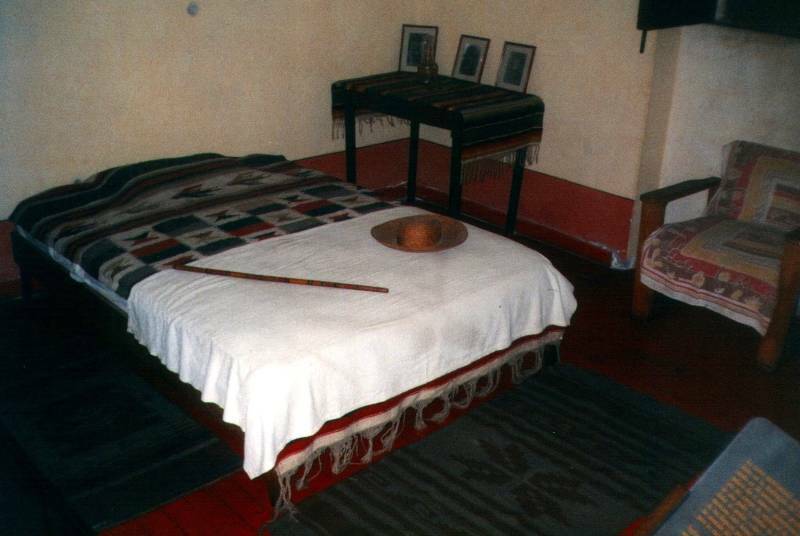 This is Leon Trotsky's Bedroom, featuring Leon Trotsky's Sombrero and Leon Trotsky's Walking Stick. 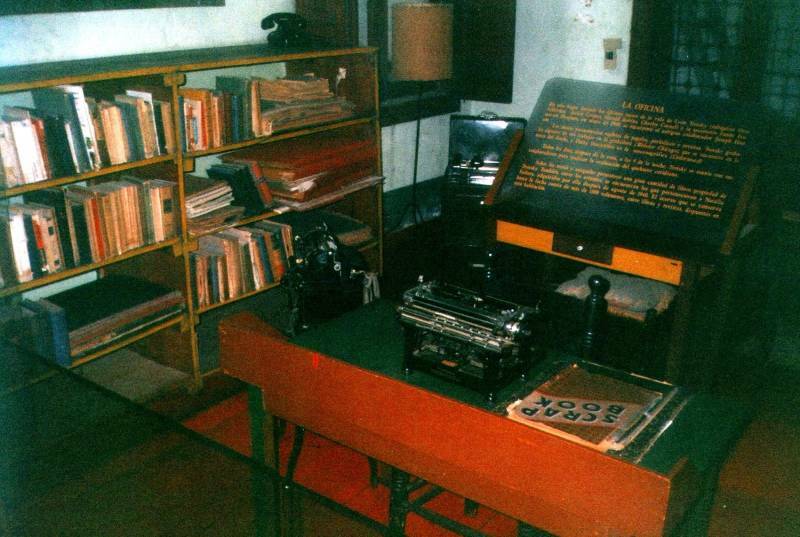 This is Leon Trotsky's Study, where he wrote a lot. Many of the books on the shelves were authored by Trotsky. This is also where he was assassinated. We are looking across Leon Trotsky's Garden, from the corner of the heavy wall keeping the proletariat at bay, across the garden to his large and luxurious house. The garden is complete with a Soviet flag and hammer-and-sickle monument above the grave holding his ashes. Trotsky was never rehabilitated by the Party, and so he is one of the few prominent Soviet figures not buried at the Kremlin in Moscow. 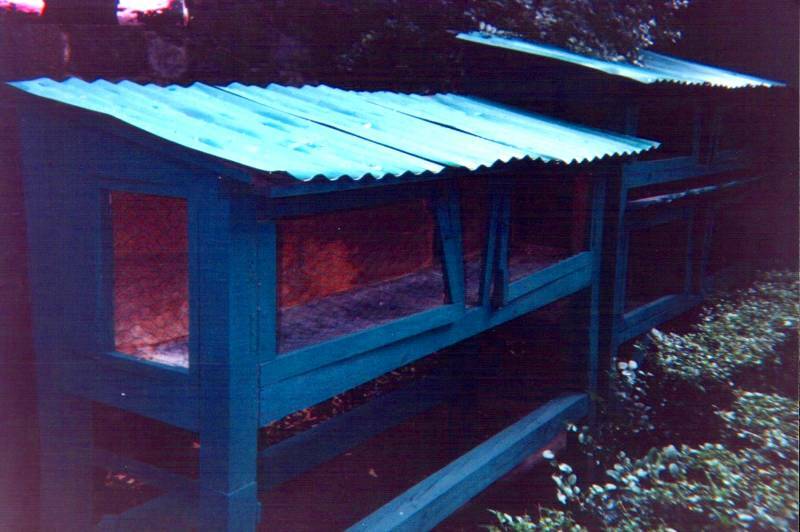 And finally, unless I can convince you to go look at those pictures of Leon Trotsky's toilet, hot water heater, and other plumbing, we end our visual tour with Leon Trotsky's Rabbit Hutches. An American leftist was there on a pilgrimage on the day I visited. He didn't seem to see the ironic humor in anything. He said that he had once won a write-in contest to Radio Havana, and got a free trip to Havana for a couple of weeks at Castro's expense. He and the other contest winners had breakfast every morning with some North Koreans, who he said were very happy to meet him and to be there. Of course — they were North Koreans! They are accustomed to being starved by their government. Give them breakfast and you own them. Trotsky's father, a well-to-do farmer, sent him to Odessa for schooling in 1888 at the age of nine. Odessa was a cosmopolitan port city, very atypical of the Russian Empire. The atmosphere of Odessa led Trotsky to an international outlook. In 1896, when he was just sixteen, Trotsky became involved in revolutionary activities after moving from Odessa to Nikolayev. He was initially a народник or narodnik, a populist revolutionary. He was introduced to Marxism, which he initially opposed but then gradually came to adopt. Trotsky helped to organize the South Russian Workers' Union in Nikolayev in early 1897. Two hundred members of this union, including Trotsky, were arrested in January 1898. Trotsky was imprisoned for two years waiting for his trial. During this time the Russian Social Democratic Labor Party was formed, Trotsky became a member, he married fellow Marxist Aleksandra Sokolovskaya, and he studied philosophy. He finally got his trial in 1900, at which he and his wife were sentenced to four years of exile in the Irkutsk region of Siberia. Leon and Aleksandra had two daughters in Siberia, but they soon separated and divorced. Meanwhile the party was splitting. One side argued that the party should concentrate on improving the lives of industrial workers. The other, which Trotsky sided with, said that the most important thing was forming a well-organized and disciplined revolutionary party to overthrow the monarchy. Trotsky managed to escape his exile in Siberia during the summer of 1902. He moved to London to join the editors of Искра or Iskra, the newspaper of the monarchy-overthrowing faction. Trotsky took the pen name Перо or Pero ("feather" or "pen"), becoming one of the paper's leading editors along with Vladimir Lenin, Georgi Plekhanov and Julius Martov. Trotsky met Natalia Ivanovna Sedova in late 1902. She soon became his lover, and they married in 1903. No one should ever claim that left-wing politics are simple. They split and squabble in a fractal fashion. The existing six editors of Iskra were equally split between Plekhanov's "Old Guard" and Lenin and Martov's "New Guard". Lenin expected Trotsky to side with his "New Guard" and give it a majority. So, Plekhanov opposed making Trotsky a full member of the editorial board. In 1903, Iskra convened the party's 2nd Congress in London. Soon after that the pro-Iskra group split into two factions. Lenin's Bolsheviks wanted a smaller but highly organized party, while Martov's Mensheviks wanted a larger and less organized one. In case you aren't confused yet, the name bolshevik refers to larger size while menshevik refers to smaller size — the opposite of those factions' desired party sizes! But the idea was that большевик or bolshevik referred to the "majority" and меньшевик or menshevik referred to the "minority". Meanwhile most of the Iskra editors (the majority! ), including Trotsky, sided with the mensheviki. Trotsky gave up on this confusing mess in September 1904 as the Mensheviks insisted on an alliance with Russian liberals and opposed reconciliation with Lenin and his Bolsheviks. 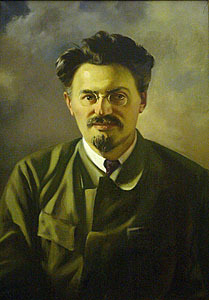 Trotsky described himself as a "non-factional social democrat" from 1904 until 1917, during which he spent most of his time trying to reconcile the various factions within the party. In his spare time he was developing his theory of Permanent Revolution. The State Emblem of the Soviet Union on an older Russian passenger train. A hammer and sickle, a red star, and two sheaves of wheat wrapped in a ribbon with "Workers of the world, unite!" in the official languages of the Soviet Union. 15 of them, one for each republic. СССР is "SSSR" spelled with Cyrillic letters: Союз Советских Социалистических Республик or Soyuz Sovietskikh Sotsialisticheskikh Respublik, meaning Union of Soviet Socialist Republics. In January 1905 a group of unarmed peaceful demonstrators were marching through Sankt-Peterburg to deliver a petition to Tsar Nicholas II. The petition called for improved working conditions, a reduction of the working day to eight hours, and increased wages, along with an end to the Russo-Japanese War and the introduction of a universal right to vote. They were approaching the Winter Palace from several directions when they were gunned down by the Imperial Guard in the Bloody Sunday massacre. Maybe about 1,000 people were killed — the Tsar said just 96, anti-Tsarist sources said over 4,000 — and disorder and looting broke out. This led to the Revolution of 1905, which in turn led to the 1917 Revolution. Trotsky returned to Russia the month after Bloody Sunday, in February, initially writing pamphlets for an underground press in Kiev but soon moving to Sankt-Peterburg. He worked there with both Bolsheviks and Mensheviks. However, the Mensheviks were infiltrated by a secret police agent, forcing Trotsky to flee to rural Finland until a national strike in October 1905 allowed him to return. The Mensheviks had come up with the same idea Trotsky had, a Soviet (or "Council") of Workers, an elected non-party revolutionary organization. The Sankt-Peterburg Soviet was up and running by the time Trotsky returned from Finland. Trotsky joined and was elected Vice-Chairman under yet another pseudonym, "Yanovsky". The chairman was arrested in November, and Trotsky took his place. On December 2, 1905, the Sankt-Peterburg Soviet issued a proclamation criticizing the Tsarist government, and it was promptly surrounded the next day by troops loyal to the Tsar's government. Trotsky and other leaders of the Soviet were tried in 1906 on charges of supporting armed rebellion. Trotsky delivered what are considered some of his best speeches at his trial, but he was convicted and sentenced to deportation and exile in Obdorsk, Siberia. On the way to Siberia in January 1907, Trotsky once again escaped and made his way to London. He arrived in time to attend the 5th Congress of the RSDLP. In October he moved to Vienna for seven years, where he participated in both the Austrian Social Democratic Party and the German Social Democratic Party. In October 1908 Trotsky founded Правда or Pravda, meaning "Truth". Pravda became a party-financed "central organ" in 1910, and Trotsky kept publishing it until April 1912. 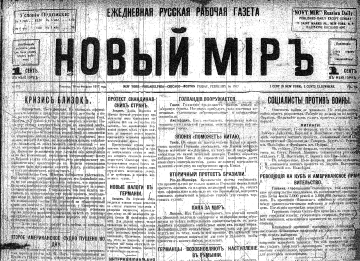 The very same month, the Sankt-Peterburg Bolsheviks started a new labor-oriented newspaper and also called it Pravda, greatly upsetting Trotsky. He sent a letter to the Mensheviks denouncing the newspaper-title-stealing Bolsheviks in general and Lenin in particular. Unfortunately, the police intercepted the letter and kept a copy in their archive. The letter was found in the archive in 1924, soon after Lenin's death, and it was used to portray Trotsky as an enemy of Lenin. Trotsky continued to write articles for radical Russian and Ukrainian papers, including Kievskaya Mysl, which in 1912 sent him as their correspondent to cover the two Balkan Wars. World War I broke out in late July of 1914. This pitted Austria-Hungary against the Russian Empire, and so within a week Trotsky had to flee to neutral Switzerland to avoid arrest in Vienna as a Russian. Once there he worked with the Swiss Socialist Party and quickly cranked out an anti-war book, The War and the International. At the end of March the French deported Trotsky to Spain because of his anti-war activities. The Spanish didn't want him either, although they let him stay until Christmas of 1916 when they deported him to the United States. Trotsky arrived in New York on January 13, 1917. He was there for not quite three months. He lived in the Bronx, at 1522 Vyse Avenue, but he worked for Новый Міръ or Novy Mir, "New World" in English, where he worked alongside Nikolai Bukharin and Alexandra Kollontai. Bukharin went on to be a member of the Politboro and Central Committee of the Soviet Union, and editor in chief of Pravda (the post-revolution Soviet one), Bolshevik, Izvestia, and the Great Soviet Encyclopedia. Then he opposed a number of Stalin's policies, and fell victim to the "Moscow Trials" and purges of the late 1930s. Notice the spelling, the pre-revolutionary Міръ instead of the sleek revolutionary Мир. Trotsky also wrote articles that were translated into Yiddish for publication in Der Forverts, "The Forward", a Yiddish radical publication. 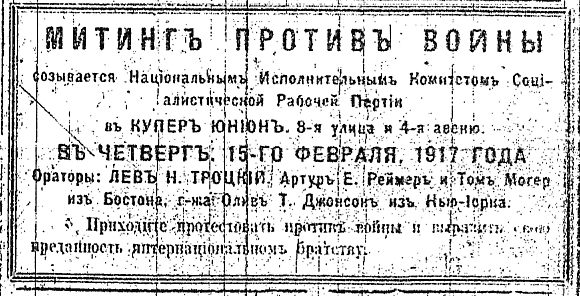 Above is an announcement in Novy Mir of a meeting against the war. It's to be at Cooper Union, at 8th Street and 4th Avenue, on the 15th of February, 1917. The first "orator" or speaker, listed in all capitals, is Lev N. Trotsky. The February Revolution of 1917 overthrew Tsar Nicholas II, and Trotsky left New York by ship on March 27th. He reached Russian on May 4th, joining the Mezhraiontsy regional social democratic organization in Sankt-Peterburg, also known as Petrograd around this time. He was elected a member of the first All-Russian Central Executive Committee (ВЦИК or VTsIK) at the First Congress of Soviets in June. Trotsky was arrested, again, after an unsuccessful Bolshevik uprising in August. He was held for 40 days and then released. The Bolsheviks gained the majority in the Petrograd Soviet, and Trotsky was elected its chairman on October 8th. By the end of 1917 Trotsky was clearly second only to Lenin in the Bolshevik Party. Trotsky became the People's Commissar for Foreign Affairs. He resigned that position on March 13th, 1918 to become People's Commissar of Army and Navy Affairs and the chairman of the Supreme Military Council. The position of commander-in-chief was abolished, granting Trotsky full control of the Red Army subject only to the oversight of the Communist Party leadership. On and on.... Criticism of Trotsky's military leadership in 1919, Trotsky was put in charge of national railroads in 1920, meddling with the trade union system in 1921, and then Lenin's health began to deteriorate. Lenin had three strokes between May 26th, 1922 and March 10th, 1923. These caused paralysis and loss of speech. Lenin died on January 21st, 1924. Stalin, Zinoviev and Kamenev formed a troika to make certain that Trotsky would not succeed Lenin, despite his official public position as second only to Lenin. Trotsky lost his positions and political power in 1925. He was expelled from the Central Committee in October, 1927. Trotsky was exiled to Alma Ata in Kazakhstan on January 31st, 1928. Just over a year later in February 1929 he was expelled from the USSR to Turkey. He and his wife and son lived on the island of Büyükada near İstanbul, Turkey for four years. French Prime Minister Édouard Daladier offered Trotsky asylum in France in 1933. He lived there in Royan and Barbizon, but was told in 1935 that he was no longer welcome in France. He lived near Oslo, Norway for two years, at which point he was put under house arrest. Norwegian officials arranged his transfer to Mexico by cargo ship. The Mexican president Lázaro Cárdenas welcomed Trotsky when his cargo ship docked at Tampico, and arranged for a special train to carry him to Mexico City. Meanwhile, in 1936 the first "show trial" was staged in Moscow. Trotsky, Zinoviev, Kamenev, and over a dozen others confessed to having joined Trotsky in a plot to kill Stalin and other Soviet leaders. They were all found guilty and sentenced to death, the sentence being passed on Trotsky in absentia. In May of 1940 a group organized by NKVD deputy director Pavel Sudoplatov and led by GPU agent Iosif Grigulevich, the Mexican painter David Alfary Siqueros, and Vittorio Vidale launched an assassination attempt. The group disguised themselves as police officers and overpowered Trotsky's guards. They set up machine guns in the inner courtyard of the home and began firing. Everyone inside hid underneath bedroom furniture as the attackers fired into the various rooms of the house. I don't know if that was the source of the damage next to the toilet in the pictures above. Trotsky's grandson was shot in the foot, and Robert Sheldon Harte, one of Trotsky's assistant and bodyguards, was abducted and later killed. The other guards eventually repelled the attack. An ice ax can be useful for scaling wintry surfaces or for assassinating lapsed revolutionaries. Leonid Eitingon, a GPU agent who had operated in Spain, headed the second attack. Mercader, as either Frank Jacson or Jacson Mornard, started meeting with Trotsky in the guise of a sympathizer. As for the Trotsky family, his great-granddaughter Nora Volkow is head of the U.S. National Institute on Drug Abuse. 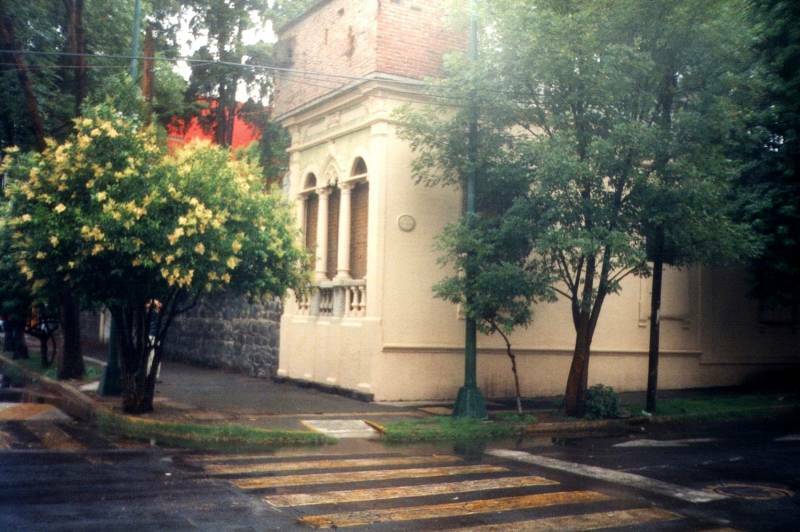 She grew up in the Trotsky house in Mexico City. The ice ax resurfaced in 2017. The Guardian reported that a Mexico City secret police officer took it home after it had been in the evidence room for several years. He gave it to his daughter, who put it up for sale in 2005. Keith Melton, an author of books on the history of espionage, collector, and a founding board member of the International Spy Museum in Washington, D.C., purchased it.